What if C-3PO had a bad childhood? 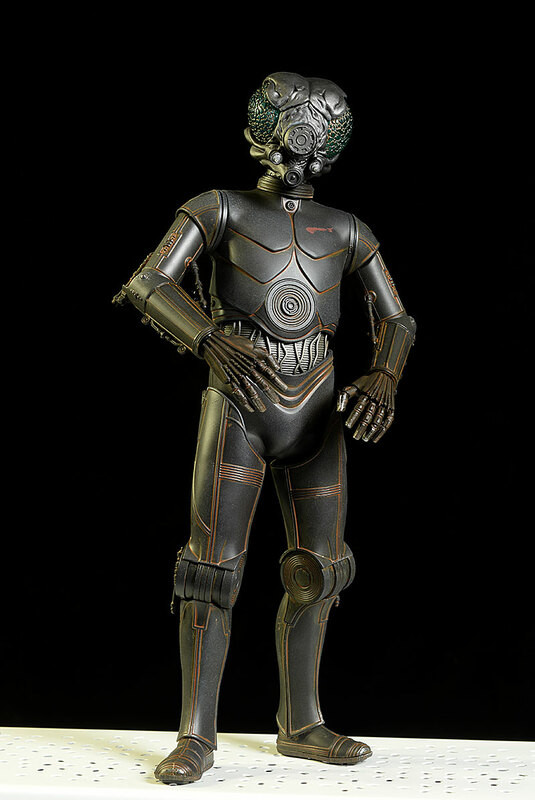 A hard knock life for the young droid, and perhaps he would have turned out different - that's how I always thought of 4-LOM. 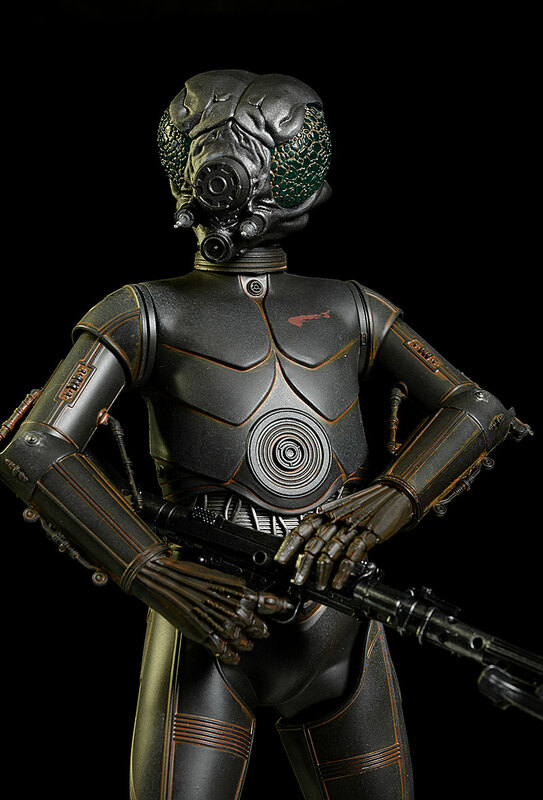 One of the key bounty hunters after Han Solo, he didn't have a lot to do in any of the flicks, and yet we all remembered his look. 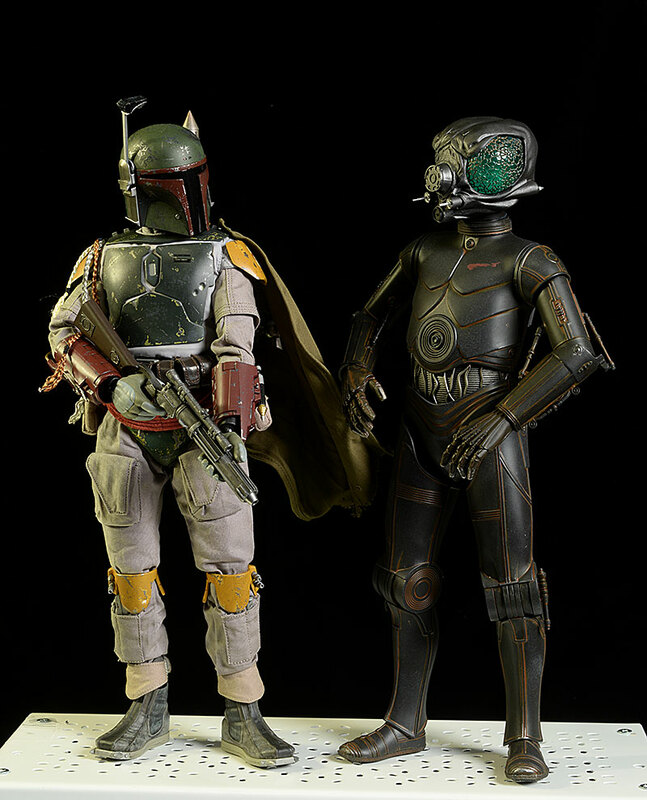 Hasbro did a 4-LOM in sixth scale back in the day, but then, they did just about every character in sixth scale then. Sideshow has finally replaced that one with a 'high end' version, which is only available through them. He just started shipping, and will run you around $210. Nothing unique here, but it's attractive enough. The five panel wrap around cover is held in place with magnets, and inside is a single plastic tray holding the figure and accessories. It's all collector friendly, and all very easy to work with. 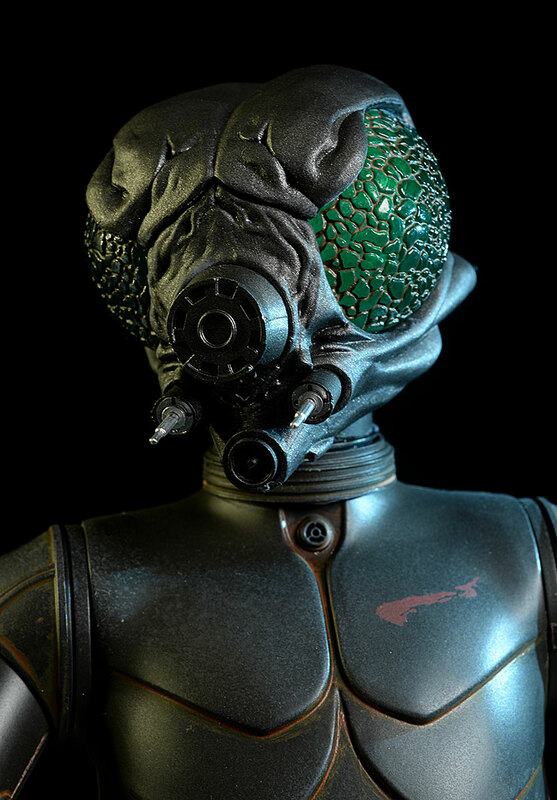 4-LOM might be a droid, but he has some very insect-like attributes. 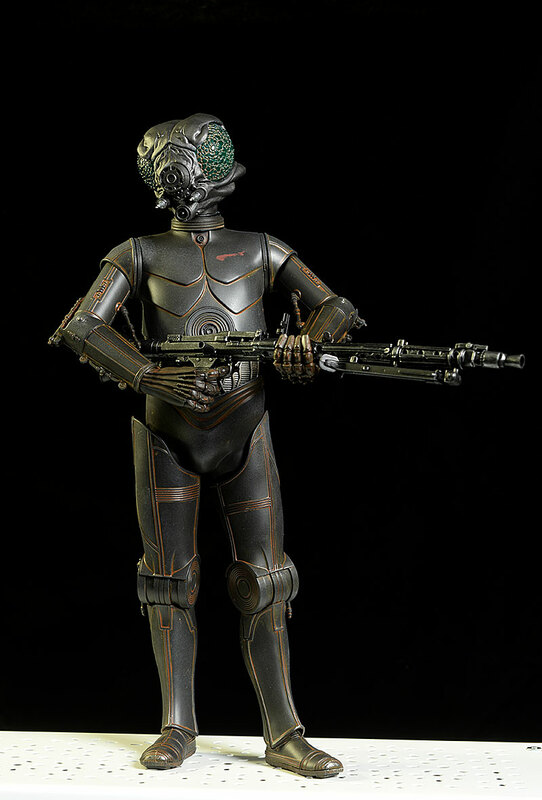 From the neck down, he's all 3PO. 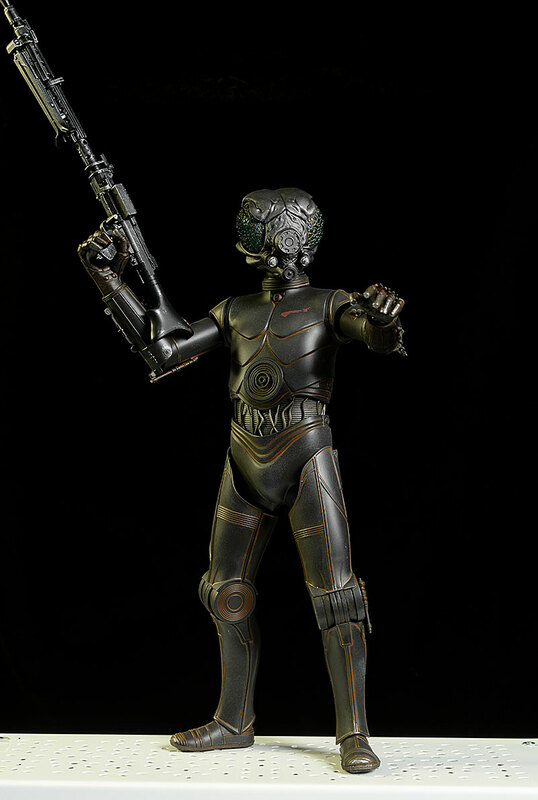 The torso and mid-section are quite different than the earlier sixth scale 3PO that Sideshow released, but the arms and legs look pretty identical to my eye. The work on the mid-section wiring is a little less detailed here, but the pistons on the arms work nicely. The head is where all the special is, and it's plenty of special. The buggy eyes are made from a translucent green plastic, with lots of texture and definition. Even the head has texture, and the folds and wrinkles look great. 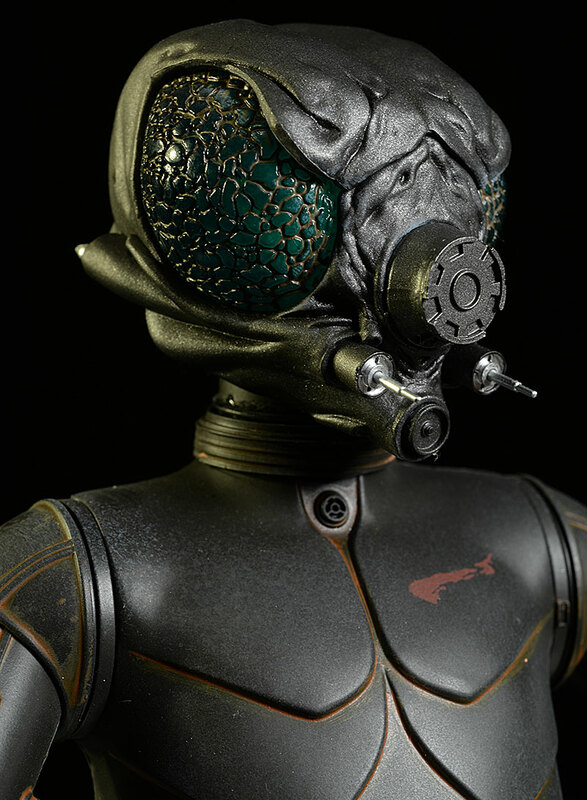 He's all droid, but the head gives the impression of 'bug' while remaining mechanical. He stands right about 12" tall, and the two sets of hands are sculpted to work with various poses and the weapon. The overall paint work has a metallic sparkle to it, with just a little texture on the head itself. There's some weathering on the body, designed to look largely like rust and corrosion, but the effect is iffy, at least for me. Much of it looks exactly like paint, not corrosion, like the splotch across his chest. In other areas it's a bit better, and the work on the various aspects of the face and eyes is excellent. I particularly like those green eyes - you have to hit them just right with the light to see it, but when you do, it's pretty impressive. While some of the joints are a bit restricted, I was still able to get some fluid stances. The ball jointed neck allows for tilt and lean movement, and you can add just a little personality to most poses. The shoulders turn, but have only a little bit of in/out movement, making the arm poses tougher. The elbows move in and out on the single pin, and the wrists are the usual rotating hinges. The fingers are NOT articulated, but the gripping set works well with the gun, and they swap quite easily. The hips allow for movement in all directions, albeit limited movement. He certainly can't sit, but the legs can take slightly relaxed stances. The rocker waist has some movement, but don't expect a lot. The pin knees and rotating hinge ankles round things out. 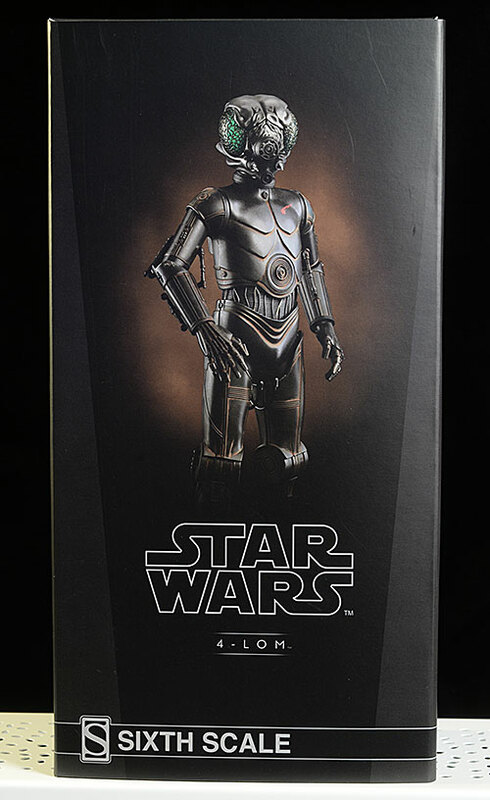 The overall design is similar to the earlier C-3PO, and he can move much better than you might expect. He's not going to be taking any super deep stances or ninja poses, but he can look natural on the shelf. This is a pretty limited area this time around. There's one extra set of hands - gun grips - to go with the relaxed hands he comes wearing. There's the DL-19 blaster, which does sport a fantastic sculpt and paint job (as well as the folding bi-pod support in front), and the hexagonal display stand with support. And yep, that's it. Considering the price point, that's mighty light. You'll have some fun finding a good pose for this guy, and you can shift him around enough to re-pose him now and again. While the pistons on the arms are a little delicate, you shouldn't have any issues with basic care. Sorry, but this guy shouldn't be more than $150. There's enough re-use here and very few extras, making the $210 price point a tough pill to swallow. Obviously, the pistons on the top and bottom of the elbow are your one area of concern. They are pretty sturdy, and they do pop loose on one end under pressure, rather than simply snap. More dangerous than moving the arm is squeezing the arm, like when you're swapping hands, and gripping the pistons while you do it. You could crush them this way, so take care when changing hands. This guy IS a hefty step up from the old Hasbro version. 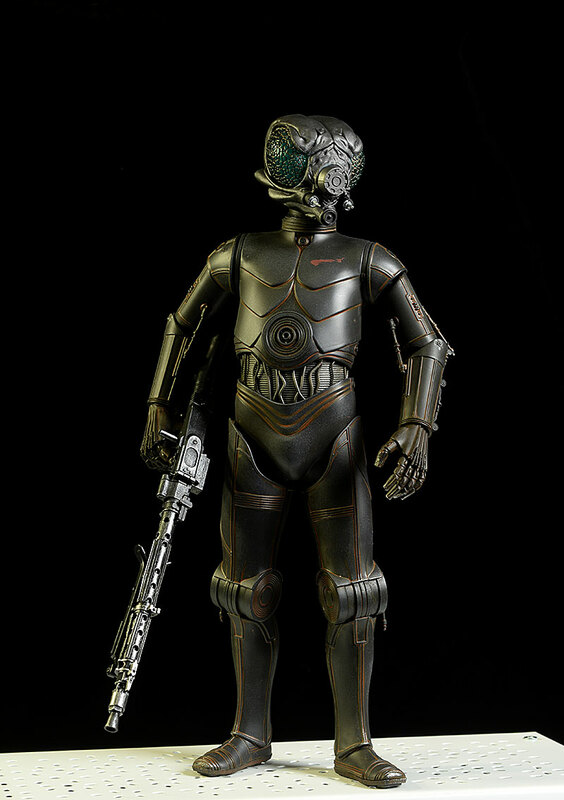 He looks great with other bounty hunters, and Zuckuss and Dengar should be here soon to keep him company. But the price point is a good $60 over where you'll feel really comfortable, and whether that's a deal breaker for you or not is dependent on your cost aversion. - Sideshow held on to this one exclusively, where you can buy it for $210. 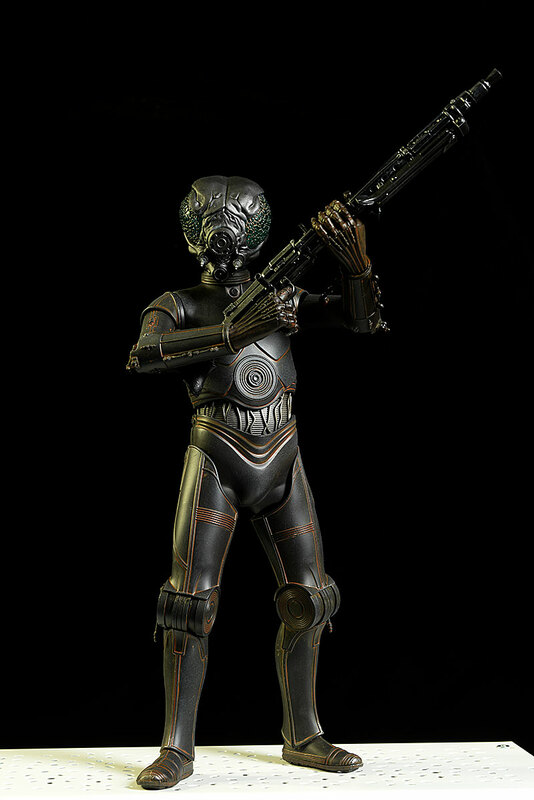 Star Wars sixth scale reviews have been the thing for me to do this last week, with the Death Trooper Specialist, Shoretrooper, and Chirrut Imwe just last week. Prior to that was the most recent Darth Vader, the Jedha Patrol Trooper, the Resistance Outfit Rey and the regular Rey with BB-8, a fantastic set.